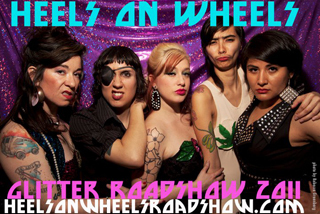 Heels on Wheels is a glittery roadshow heading from Brooklyn through the Great Midwest with a queer performance-art cabaret of radical extravagance and thought-provoking glamour. Our fearless performers rampage across the femme-inine spectrum-from hi-femme to femmedrogyny, dandy darling to ladybeast-serving up poetic theatre, silly buggery, dark whimsical puppetry, and rocknroll you can sink your heels into — stillettos fly, Vaginas sing, and fairytales fracture as we travel through space, time, and stardust. The 2011 tour features dazzling troublemakers Heather Acs, Damien Luxe, Shomi Noise, Geppetta, and Amanda Cheong, with visual artist Lixanne Disaster. We’re getting in our dreamy van for this epic NYC-to-Minneapolis trip April 15-25, 2011! Sun Apr 24 Dinner with our grandmas. Mon Apr 25 Philly 8p doors, 8:30p show at Fancy House, 4951 Catharine St.